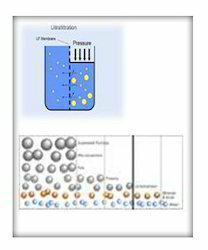 Our range of products include ultrafiltration nanofiltration. Our organization is involved in manufacturing, supplying and exporting a wide range of Ultrafiltration Nanofiltration. They have a medium-high working pressure and they are normally used to reduce water hardness, to recover salts from dying baths, to remove colour and to recover acids and caustic soda. we offer our products in market with minimum cost and low maintenance. Looking for Ultrafiltration Nanofiltration ?